It’s amazing how the economic situation has turned in the past 9 years. In 2009, investors and economists were discussing the possibility of how recessions were getting worse. That’s a daunting potential trend because a recession worse than the 2008 financial crisis would be catastrophic. There was recency bias in that claim because the reality is the 2001 recession wasn’t worse than the previous one. The crash in stocks was bad in 2000 because they were possibly the most overvalued in history, but the economy and stock market aren’t the same thing. The new trend shown in the chart below created by @Not_Jim_Cramer on Twitter is economic expansions appear to be getting longer. That observation might have some recency bias since we are in a long expansion right now. However, it’s clearly rooted in more evidence than the claim recessions are getting worse which was made in 2009. 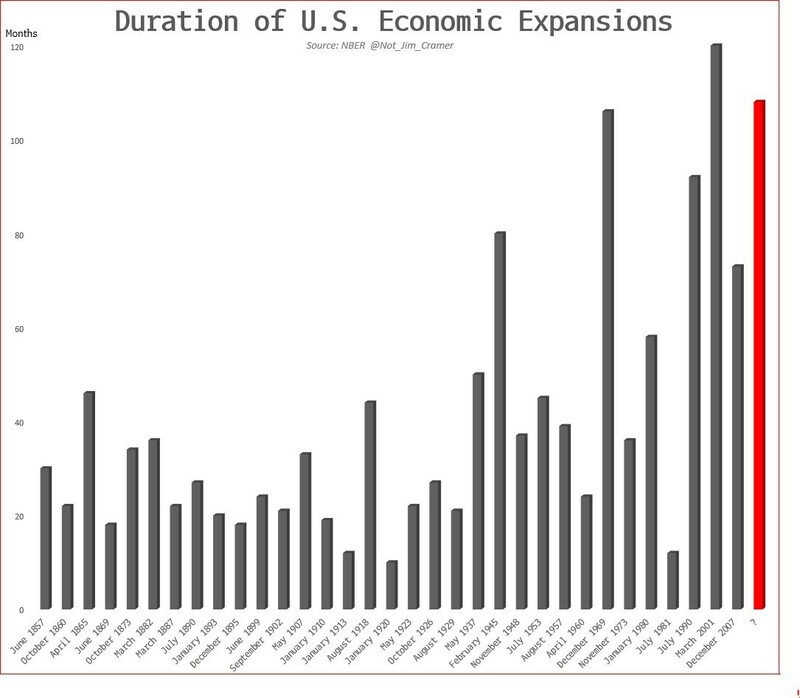 The past 4 expansions are rated as the 1st longest, 2nd longest, 4th longest, and 6th longest since 1857. That includes 34 business cycles. It’s difficult to come up with one reason for this change since the current economy is monumentally different than it was in the late 1800s and early 1900s. 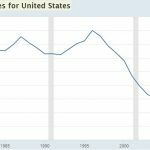 One aspect which is clear is if you have invested based off the notion that recessions occur every 7 years or so, you have lost a lot of money. That’s a silly notion that revolves around lazy thinking. We’re not saying there won’t be a recession soon based on only this data; this is just an observation to consider. We’re saying basing an actual investment thesis around the fact that recessions occur every 7 years simply is not rigorous enough analysis to make you money. 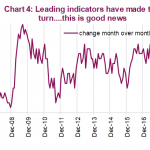 Since this is about to be the longest expansion in our lifetimes, some investors are getting nervous about the end of the business cycle. Because it has lasted so long, many investors haven’t experienced a bear market. Anyone with less than 9 years of experience hasn’t seen a full business cycle. Some of these traders are oblivious to the fact stocks can go down and others are hedging because they know the results can be bad. To be clear, being experienced isn’t enough to allow you to outperform during a bear market. Many seasoned investors were crushed in 2008. Also, not having experience doesn’t prevent you from doing well during market crashes. 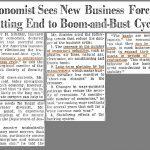 The question of when the next recession will occur can’t be answered in this article, but we can give you tips to improve your forecasting ability. Predicting where markets and the economy will go isn’t like you see on TV. You don’t just guess what will happen at the end of the year and see where the roulette wheel lands. Great investors come up with the odds of various events unfolding and then adjust their models as new data comes in. Forecasts aren’t black and white. Since we know we don’t know the future absolutely, we come up with the odds of a recession. The first chart below from the NY Fed shows its recession model based on the yield curve. The model is somewhat awkward in that the odds of a recession occurring in the next 12 months being 30% is a warning sign to avoid risk assets. You’d think 30% odds are fairly low, but they aren’t in this case. The odds of a recession have been below 10% for 5 straight months. Each of the last 6 recessions saw 30% odds before they occurred. This is reasonable analysis because the yield curve is flattening. Recessions usually occur when the curve steepens after being inverted. Rate cuts are anticipated and then the Fed reacts as bad economic data starts to come out. The takeaway from this model is there won’t be a recession in the next year. 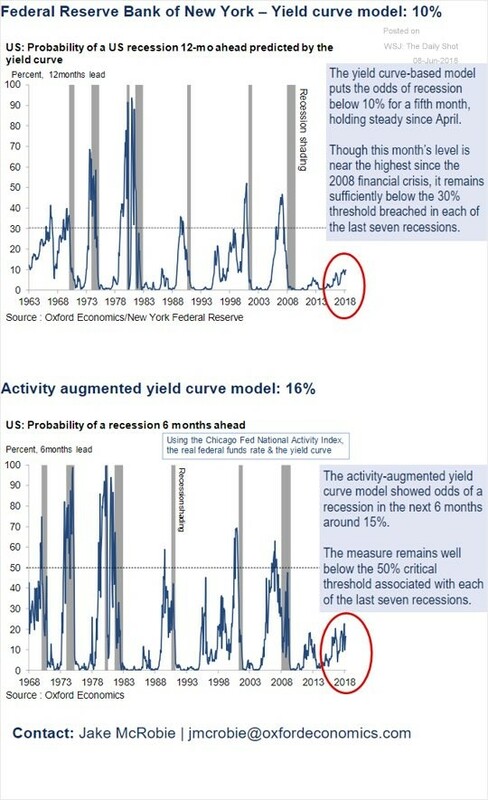 The 2nd chart above shows the activity augmented yield curve model for forecasting recessions. This one forecasts recessions in the Chicago Fed’s National Activity index. The activity index from April showed a 0.34 reading which is very strong. The other good news is it is far from 1.00 which is where inflation becomes a problem because the economy is overheating. This is why the index predicting a recession for the next 6 months is only at 16% which is far below the threshold for a recession which is 50%. This index’s warning threshold is likely higher because it’s predicting for a shorter time frame. The takeaway here is a recession isn’t coming in the next 6 months. That makes sense because growth is strong and there isn’t runaway inflation. In the doldrums of the correction earlier this year, there were some forecasts for a recession in late 2019. To be clear, that’s because Q1 GDP growth was slow, coming in initially at 2.3% growth (revised to 2.2%) and stocks were faltering. 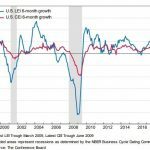 Prognosticators have been slowly backing away from these forecasts and moving recession predictions to 2020 now that the stock market has rebounded and GDP growth is expected to be 3.7% in Q2. 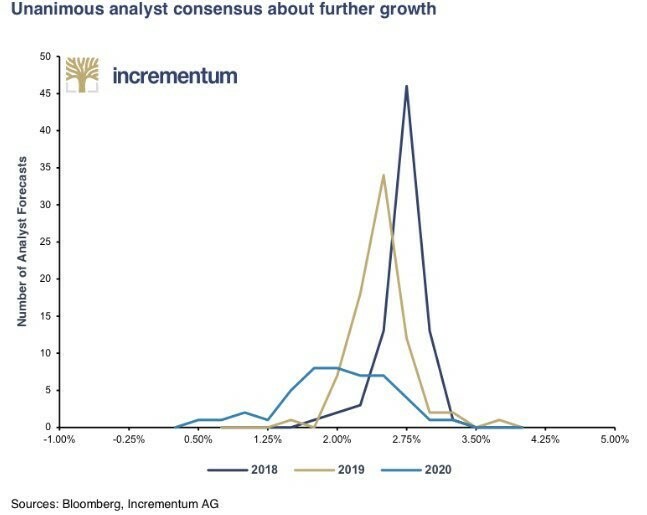 The Incrementum chart below shows a survey of 78 analysts’ forecasts on future GDP growth done by Bloomberg. There is virtually unanimous consent that economic growth will be positive in the next 18 months. The expectation is for about 2.75% growth in 2018 and 2.5% growth in 2019. Even though those who are willing to predict recessions are now calling for one in 2020, none of the analysts surveyed are actually calling for negative GDP growth. We’ve mentioned the end of the global synchronized growth story in a few articles. America is becoming one of the few countries with accelerated growth. 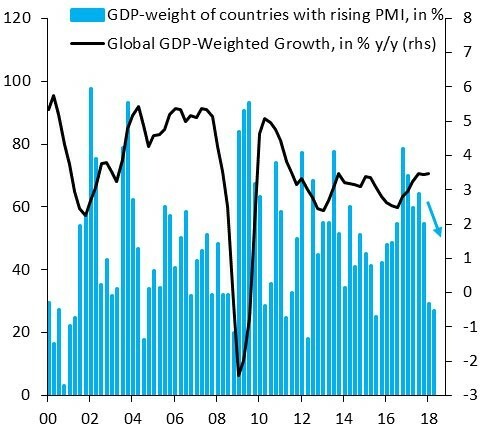 The blue bars in the chart below from the Institute Of International Finance show the GDP weight of countries with rising PMIs. The global GDP weighted growth is being buoyed by the strong U.S. growth. Anyone calling for a recession in 2018 or 2019 is likely betting on the weakness in the global economy to take US growth down. Even though many countries are seeing economic weakness in 2018, the US is firing on all cylinders as it is now just 1 year away from being in the longest expansion since 1854. Long expansions have become more common as the traders betting on a recession solely based on the length of expansions have been losing the argument and lots of unrealized gains with it. The yield curve is not showing any trouble is afoot in the next 12 months making it likely that this expansion will be longer than the one in the late 1990s. PreviousIs The ‘Gig Economy’ Real? NextInvesting & Budgeting: Are High Paying Jobs Enough?